As a student, he drew many cartoons – a small devil that has many adventures. Today, he is the one who has many adventures, because Martin Ballendat’s furniture designs go around the world. The designer has also worked for us at hülsta on several occasions. He designed the popular CUELLO armchair as well as the new solid wood collection hülsta solid. In an interview with us, he disclosed what makes his work so special. Mr Ballendat, you have been working as a furniture designer for more than 30 years – what makes you successful? I create products that are technically sophisticated and feasible but also have an emotional touch. Generally, I believe that good design is made up of two opposing poles. Opposites such as male and female, technically innovative and creatively emotional. This interplay of both worlds is something that has always intrigued me and has always been the basis for my products. With “solid“ you have designed an entire collection made from genuine wood. How did this come about? hülsta trusted me to take a comprehensive approach to the topic “solid”. “Comprehensive“ in this case means: starting with the name, the product strategy through to the individual families – as part of solid, I was able to incorporate design considerations and create a comprehensive range that covers all living areas. For the creative process, this surely means that you need to consider many different elements. How do you turn an idea into a range? Sketching plays a very important role. I therefore stay in the driving seat through the entire process and my sketches go down to the very last technical detail. A decisive aspect is the model making. I think this is where good design always starts. After all, it’s the moulding and the kneading to achieve the best, the best proportions and the best look of the range. This is one of the deciding qualities of our design studio. This ”baby” grows and grows and grows and then it becomes a good product. What would you say makes your “baby“ solid? Solid represents something very human. The range is neither elitist nor aloof. It has a caring touch whilst being a sophisticated design. Plus: each product form the “solid“ range has an intelligence, a basic idea, something smart that distinguishes this product. This combination of style, functionality and intelligence are characteristic of the range. What made you come up with the name? The name “solid“ is derived from the materials we use. We wanted to create something genuinely natural using solid materials. We also wanted to combine craftsmanship with technology. Solid in the truest sense of the word. Does this also apply to sustainability? I would say that we have created a good basis with solid. We work with honest materials: precious solid wood, non-galvanised steel, wood, glass and ceramic. 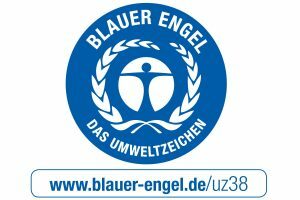 This turns solid into a genuine range – which has, by the way, been awarded the environmental sign “Blue Angel”. Mr Ballendat, thank you for talking to us!